Coleophora atriplicis Meyrick, 1928. Handbk. Brit. Lep. : 763. 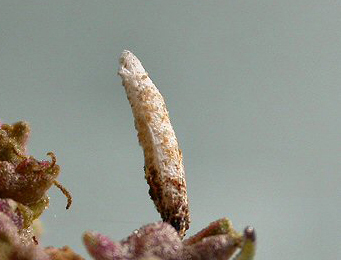 Seed-feeder and case-bearer: The larva feeds internally at first on seeds and then makes a distinctive 'dirty-looking' case, which is coated with dark granules (British leafminers). Distribution in Great Britain and Ireland: Britain including Anglesey, Caernarvonshire, Carmarthenshire, Denbighshire, Dorset, East cornwall, East Norfolk, East Suffolk, Flintshire, Glamorgan, Isle of Wight, North Essex, North Somerset, South-east Yorkshire, West Cornwall, West Lancashire and West Norfolk (NBN Atlas). The known host plant species are usually found on or near the coast. Distribution elsewhere: Widespread in continental Europe including Belgium, Danish mainland, Estonia, Finland, French mainland, Germany, Hungary, Latvia, Norwegian mainland, Poland, Romania, Russia - North, Sweden, The Netherlands and Ukraine (Karsholt and van Nieukerken in Fauna Europaea).